Breast Cancer Action has a long history of following the money and holding organizations (and people) accountable. It’s one of the reasons we have such a strong conflict of interest policy. We know that financial influence and corporate greed can prevent organizations from prioritizing what matters, putting people over profits, and acting with the highest level of integrity. As guardians of public trust, it’s especially important that our elected officials act as champions for our communities, not for the profit of the oil industry. Then why are California legislators failing to even consider meaningful legislation that would put public health before oil industry profits? Because in the past ten years the oil industry has spent $266 million on lobbying and campaign contributions to weaken regulations and expand drilling in California, the nation’s 3rd-biggest oil-producing state. Tell Governor Jerry Brown and elected state officials to stop taking money from the oil industry and start putting public health first. 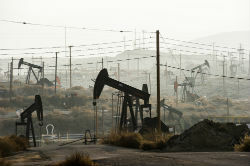 We know that dangerous oil drilling practices are harmful to health and may be linked to breast cancer. In fact, carcinogens specifically linked to breast cancer such as benzene and toluene have been found in drinking water near gas wells at levels that are four times the legal limit. Of the 2 billion gallons of chemicals used in fracking across the US, 25 percent are linked to cancer and 30 percent are known endocrine disruptors. This is particularly concerning for women currently in treatment for breast cancer as hormone disruptors can interfere with commonly used treatments. It’s time to prioritize women’s health by limiting the influence of corporations on lawmakers and getting oil money out of politics. As California goes, so goes the nation. We have an opportunity to send a strong message to California lawmakers, and the rest of the country, that public health should come before corporate profit. Sign this petition today and fight back against the influence of a toxic industry linked to breast cancer!